China never pressurized the Sri Lankan government to hand over operations of the Hambantota port to a Chinese company, says prime minister Ranil Wickremesinghe. The PM was making a statement to parliament today (05) with regard to the June 26 ‘New York Times’ report which claimed China funded ex-president Mahinda Rajapaksa’s campaign at the 2015 presidential election. The article also alleged China got Sri Lanka in a debt trap and secured the Hambantota port through it. 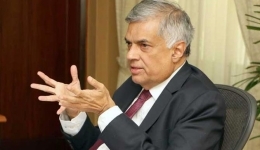 Speaking in parliament yesterday, PM Wickremesinghe only said an investigation would be conducted into the campaign money charge, and did not refer to the other allegation. “…Had China demanded, the airport too, could’ve been given. We deal both with China and India as a sovereign state…”In his speech to the House today, he said the Rajapaksa regime built the port on a 1,320 million US dollar credit from China, but the government nor the Ports Authority were capable of bringing in any ships to the port. Therefore, the government had no money to pay back the loan, he said. Since 2011, its losses amounted to Rs. 47 billion, and there were only two options open – declare the loan agreement to be illegal and act accordingly, or to negotiate with the Chinese government. The latter was chosen and at the discussions, it was decided to handover the port’s operations to a state-private partnership company in order to make the port profitable, he said. For that, the Chinese government did not pressurize Sri Lanka, he said. What China asked was only to call for bids first from Chinese companies, and that was done. The most profitable one was the China Merchant Port proposal for a 1,080 million USD investment. This does not amount to a selling of the port, only the port operations are being done by a state-private partnership, said the PM. In the meantime, China did not respond favourably at discussions regarding the Mattala airport, and now talks are underway with India, he said. Had China demanded, the airport too, could’ve been given. We deal both with China and India as a sovereign state, the PM concluded.